The rapid growth of end-user computing (EUC) has dramatically affected the nature of information systems in many organizations and many countries. EUC proliferation is more evident in organizations in developing countries because of steady improvement in the performance/price ratio of EUC computing technology. As organizations become increasingly dependent on EUC to fulfill their information requirements, the management of EUC resources demands a better understanding of the factors that affect EUC success. This paper attempts to measure and validate some individual and organizational factors hypothesized to affect the success of EUC in a developing country, namely Saudi Arabia. One hundred and fifty-eight end users in forty-five small organizations were surveyed. 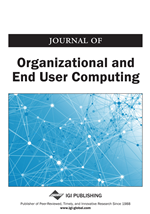 The study findings indicate that EUC success is closely associated with organization size, EUC training, source of computer application, computer literacy, top management involvement, number of system analysts, and availability of native language software. The need for a process oriented model to study organizational variables is addressed because of the importance of the time frame of the EUC adoption process.